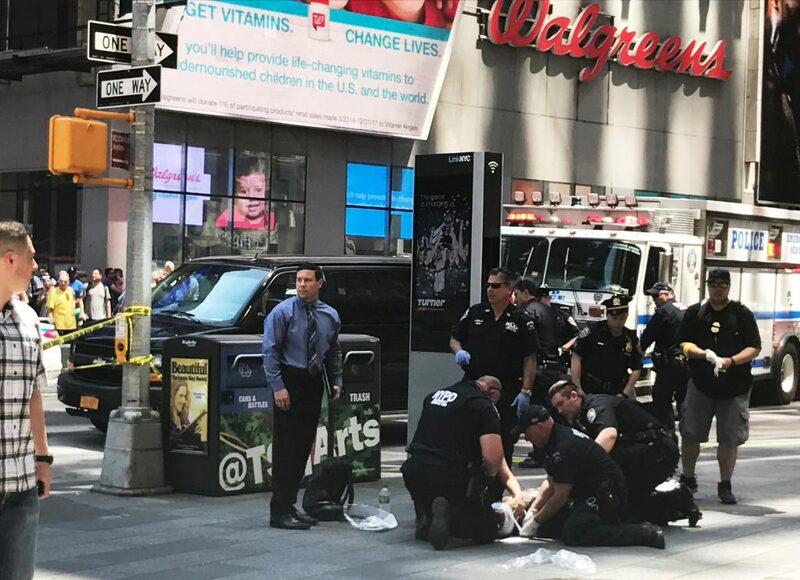 At least one person was killed and 23 people are injured after a car struck and injured several pedestrians in Times Square in New York City Thursday, the Associated Press has reported. Law enforcement do not suspect this was an act of terrorism and were testing to determine if the car’s driver had consumed alcohol before getting behind the wheel, AP reported. The red sedan overturned, resting on steel barricades designed to protect pedestrians and block vehicular traffic. The front end of the car appeared severely damaged in photos posted on social media after the event happened. 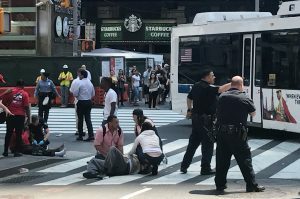 The New York City Police Department confirmed on Twitter that the vehicle collided with pedestrians shortly after noon. Due to a vehicle collision with pedestrian injuries, emergency vehicles are in the area of #TimesSquare. Expect delays in the area. Alex Rodriguez, who works at a street stand selling T-shirts and hats to tourists on the corner of 46th and Broadway, said he heard a “boom” around 12 p.m. coming from Times Square. Rodriguez said police officers and firemen quickly descended on the scene, with some members of the New York Fire Department leaving their emergency vehicles that had been stuck in traffic and running toward Times Square. Greg Oppenheim, a comedy show promoter and a certified paramedic who recently moved back to New York City from Florida, was “in the middle of a pitch” to a potential client but didn’t immediately notice the apparent car accident “with all the bangs that go on in Times Square,” until he saw a commotion near the crash. Oppenheim’s first thought was that it was a bomb. “It makes you think somebody made an attack,” he said. He “saw a couple of people crying” who had witnessed the aftermath of the accident that killed one person and injured 23 others, but noted many more people moved toward the scene, apparently to get a closer look. “The car was on fire, the engine was on fire,” Oppenheim said, also noting that rescue workers quickly pulled the hood off the vehicle to extinguish the blaze.